I am roaring toward my first year on Empire Avenue. A few details about how I play. I was very fortunate to have excellent guidance that helped me focus on being successful with EAv. The advice was simply to concentrate on building wealth. Everything else will follow. I don’t do Social Media professionally; so this is mostly a game for me. I sell Rocket Science to Luddites and play tennis. My Share Price exceeded 400 at about 8 months, I was at 500 before the end of April. The only thing I do to support my share price is avoid red days. Up .05 or up 5.00 eaves is all the same to me. I have no idea how I got so expensive. My Net Wealth is over 750M, and I receive about 3.2M per day in Dividend Income each day. Still working to increase my divs, but I have a new plan. I don’t think there is a stock newer who is higher on the wealth or share price leaderboard. Omar & I fight over the most active on the EA Network…he usually wins. I typically run a FB & G+ bomb mission daily to support my divs. I run Twitter & WordPress missions when they make sense. Each day I at least match every active investor. Active is 3 EA actions a week by my definition. Each day I use Dr. Dittrich’s Inside EAv tool to buy a few shares of everyone who is invested in me. I typically also make a run to buy a few shares of every active player in my portfolio. That gets folks invested in me a couple of buys on most days. This is helpful for my EAv activity and reminds folks about my investment in them. I own more shares of all these stocks than they own of me. I realize that my share price is higher (much higher in many cases) than than most of my investors. I understand that many folks will have difficulty matching my investment; mostly, I just want some sense of mutual effort. If you are bothered by my investment practices, it is easy to stop my daily purchase. You can buy 1500 of me, I will match; since we are maxed…no more small buys. You can also sell me at which point I will block you. I wrote a blog post about this, but basically I don’t want to waste my eaves investing in anyone who is selling me. I have mostly given up trying to go through the list of folks who bought my shares each day. I want to acknowledge the investment and to be sure that I appropriately reward that investment with a buy back. Just don’t seem to be enough hours in the day to visit every profile. If your price trends and dividends are attractive, you will find yourself well rewarded. If you are struggling, I am likely to simply match. I have no magic formula here. My level of buy back is partly dependent on how many eaves I have and partly on my attitude toward life. I have all the Pie. I am at 4,500, Port 12, right now. Port 13 is 5,000 profiles, and I will get that shortly. Since EA only pays dividends on the top 5,000 stocks that you own, I am unclear what will happen next for me. I suspect a couple more to provide some headroom, but who really knows. I buy dessert infrequently. I play with eaves instead of cash, but I appreciate the folks who spend money; since I realize that Dups is not running a charity. A couple of dark side items. I usually don’t check for mission thieves, but when I do…I report you, I block you, I rate you negatively, and I ask my friends to do the same. It is a bad value; so just don’t do it. If you sell me, you are stupid. I guess that is arrogant, but I have never had a red day and my dividends are decent; so why? It has gotten easy to check so you are likely to be found…yes even partial sells. I use the same strategy as I do for the mission thieves…sell, block, & ask my friends to do the same. Too many great folks on the Avenue to deal with creeps. If you don’t invest back in me, I consider you my savings account. I have not ever and don’t plan to beg for buy backs; just want you to know. If you become inactive, turn red, your divs drop below .34 (that is the top 5,000 today), or I am broke; you might get sold. 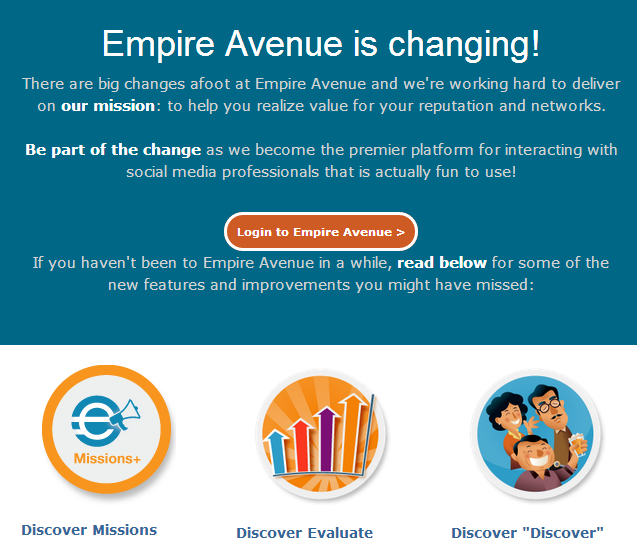 Let’s just be friends, treat each other with kindness, and have some fun on Empire Avenue!